Including Album of the Year, Record of the Year and Song of the Year. There must have been some 24 karat magic in the air. 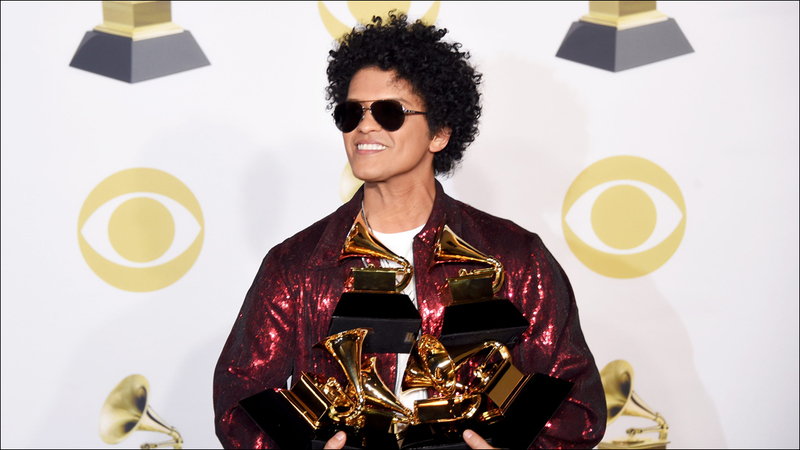 Bruno Mars was the big winner Sunday night at the 60th annual Grammy Awards, sweeping the major categories and picking up seven wins, including the coveted Album of the Year and Record of the Year. The Filipino American music-multi-hyphenate also cleaned up in four other categories, picking up trophies for Song of the Year, Best R&B Performance and Best R&B Song for "That's What I Like," and Best R&B Album for 24K Magic. Throw in the Grammy for Best Engineered Album, Non-Classical, and Mr. Mars officially walked away from the proceedings as the year's most decorated artist. Bruno also rocked a rousing Cross-Colours-soaked, 1990s-inspired live performance of "Finesse" with Cardi B, complete with retro dance moves. The only thing missing were the Fly Girls. Check it: right now, no male artist in contemporary pop music has enjoyed a longer undefeated streak this decade than Bruno Mars. His first charting single as a featured artist went to No. 1 on the Billboard Hot 100 in May 2010, followed by his first single as a lead artist five months later. He's topped the chart seven times this decade, more than any other male artist. Each of his three LPs has been certified multi-Platinum. You could say Bruno Mars had great night. But really, he's having the best damn decade.